Not all Jews are part of the cruel elite. On 12th July 2014, a group called Jews Against Genocide (JAG) held a memorial service for Palestinian children killed by Israel. Jews Against Genocide (JAG) is a movement of Jews from around the world, including Israelis, who are protesting against Israel’s intent to commit genocide against the non-Jewish indigenous people of Palestine. It is important to understand the part played by the rich elite - the feudal lords and robber barons - in abusing children. India is run by feudal lords and robber barons who are just as selfish as the Israeli elite. Many children in feudal countries such as India die from encephalitis and similar diseases spread by Faeces in groundwater. Around 600,000,000 people in India are too poor to have toilets and so they have to defecate in the street or in fields. Mortality rates for children are higher in Hindu families than Muslim ones. 67% of all Hindu households practise open defecation, compared with just 42% of Muslim ones. Hindus have their 'untouchables', the equivalent of the Palestinians. Rabbi Marc Schneier (right) and the Saudi King. The rich elite Moslems are in bed with the rich elite Jews. And many Moslems, including members of Hamas, will happily work for Mossad in return for money. UK Conservative party's George Osborne and Russian Oligarch Oleg Deripaksa who met on Nat Rothschild yacht. The British elite are in bed with the elite from Putin's Russia. For example, David Cameron's Conservative party has received huge donations from wealthy Russians, including Lubov Chernukhin, the wife of Vladimir Putin’s former deputy finance minister. Lord Mandelson is a director of the giant Russian conglomerate Sistema, controlled by billionaire Vladimir Yevtushenkov, a Putin confidant. Charles Hendry, Conservative government energy minister from 2010-2012, has links to the Russian energy giant Rosneft. Sir Michael Peat, Private Secretary to Prince Charles from 2002 to 2011, is director of Evraz, the Russian steelmaker. Aid agencies say that a child had been killed in Gaza on average every hour for the preceding two days. Israel bans radio advert listing names of children killed. Updated July 22 at 6:45 pm: The Gaza health ministry has confirmed the deaths of 627 Palestinians so far in the besieged strip since Israel began its relentless assault on July 8. Among those killed, at least 158 were aged 18 or younger. On Sunday, more than 74 people were killed in al-Shujayeh, a neighborhood east of Gaza City. According to sources in Gaza’s health ministry, 80 percent of the people killed were children under the age of 18, women, and elderly. The youngest victim so far has been five-month-old Fares Jomaa al-Mahmoum, killed by Israeli tank shelling in Rafah. The next two youngest victims were both 18 months old: Mohammed Malakiyeh was killed along with his 27-year-old mother, and Ranim Jawde Abdel Ghafour was killed along with a member of her family in Khan Younis. The three oldest victims were all 80 years old. Naifeh Farjallah was killed in an air strike on the town of Moghraqa, southwest of Gaza City, and Saber Sukkar was killed in an airstrike on Gaza City. Hijaziyah Hamid al-Helou succumbed on Sunday to wounds sustained in the bombing of her home in Gaza City on Saturday night. 13. Mousa Habib, 16, from Gaza City’s al-Shujayeh neighborhood, was killed along with his 22-year old cousin while the pair were riding a motorcycle. 23. Suleiman Salman Abu Soaween, 22, was killed. 24. Abdel Hadi Jamaat al-Sufi, 24, was killed in a bombing near the Rafah crossing. 26. Abdel Nasser Abu Kweek, 60, was killed in the bombing of Gaza’s central governorate along with his son. 27. Khaled Abu Kweek, 31, Abdel Nasser Abu Kweek’s son, was killed in the same bombing. 64. Basmah Abdel Fattah al-Hajj, 57, was wounded in the bombing and succumbed to her injuries shortly afterwards. 89. Bassem Abdel Rahman Khattab, 6, was killed in a bombing in Deir al-Balah. 102. Abdel Halim Ashra, 54, was killed in an airstrike on Wednesday in the area of Birka Deir al-Balah, but his body wasn’t discovered until Friday. 109. Houssam Deeb al-Razayneh, 39, was killed in an attack on Jabalia. 110. Anas Youssef Kandil, 17, was killed in the same attack. 111. Abdel Rahim Saleh al-Khatib, 38, was killed in the same attack. 112. Youssef Mohammed Kandil, 33, was killed in the same attack. 113. Mohammed Idriss Abu Saninah, 20, was killed in the same attack. 118. Mohammed al-Sowayti, 20, was killed in the same strike. 121. Ahmed Mahmoud al-Ballaoui, 26, was killed in the same attack. 122. Ratib Sabahi al-Sifi, 22, was killed in a bombing in Gaza City along with five others. 123. Azmi Mahmoud Abid, 51, was killed in the same attack. 124. Nidal Mahmoud Abu al-Malish, 22, was killed in the same attack. 125. Suleiman Said Abid, 56, was killed in the same attack. 126. Ghassan Ahmad al-Masri, 25, was killed in the same attack. 127. Mustafa Mohammed Anaieh, 58, was killed in the same attack. 128. Rafa’at Youssef Amer, 36, succumbed to wounds sustained in a bombing in Gaza City. 129. Ghazi Mustafa Areef, 62, died when his home in Gaza City was bombed. His son sustained serious injuries. 130. Mohammed Adriss Abu Sulim, 20, was killed in a bombing in Jabaliya. 131. Fadi Yaqub Sakr, 25, was killed in a bombing in Gaza City. 132. Qassem Jaber Adwan Awdeh, 16, was killed in a bombing in Khan Younis. 133. Mohammed Ahmad Bassal, 19, was killed in a bombing in Gaza City. 134. Muhannad Youssef Dhahir, 23, was killed in a bombing in Rafah. 135. Mahmoud Abdallah Shratiha, 53, was killed in a bombing in north Gaza. 136. Shadi Mohammed Zarb, 21, was killed in a bombing in Rafah that wounded three others. 137. Imad Bassam Zarb, 21, was killed in the same bombing. 138. Nahid Ta’im al-Batash, 41, was killed in a bombing in Gaza City along with 16 family members. Dozens more were wounded in the same attack. 139. Baha Majid al-Batash, 28, was killed in the same bombing. 140. Qassi Isam al-Batash, 12, was killed in the same bombing. 141. Aziza Youssef al-Batash, 59 was killed in the same bombing. 142. Mohammed Isam al-Batash, 17 was killed in the same bombing. 143. Ahmad Naman al-Batash, 27 was killed in the same bombing. 144. Yahya Alaa al-Batash, 18 was killed in the same bombing. 145. Jalal Majid al-Batash, 26 was killed in the same bombing. 146. Mahmoud Majid al-Batash, 22 was killed in the same bombing. 147. Marwa Majid al-Batash, 25 was killed in the same bombing. 148. Majid Subhi al-Batash was killed in the same bombing. 149. Khalid Majid al-Batash, 20 was killed in the same bombing. 150. Ibrahim Majid al-Batash, 18 was killed in the same bombing. 151. Manar Majid al-Batash, 14 was killed in the same bombing. 152. Amal Hassan al-Batash, 49 was killed in the same bombing. 153. Anas Alaa al-Batash, 10 was killed in the same bombing. 154. Qassi Alaa al-Batash was killed in the same bombing. 155. Rami Abu Shanab, 25, succumbed to wounds sustained several days ago in Deir al-Balah. 156. Khawla al-Hawajri, 25, was killed in a bombing in Nusseirat. 157. Mohammed Ghazi Areef, 35, was killed in a bombing in Gaza City. 158. Ahmad Youssef Daloul, 47, was killed in a bombing in Gaza City. 159. Hijaziyah Hamid al-Helou, 80, succumbed to wounds sustained in the bombing of her home in Gaza City on Saturday night. 160. Fawzia Abdel A’el, 73, was killed in a bombing in Gaza City. 161. Haitham Ashraf Zarb, 21, succumbed to wounds sustained during an attack on Rafah on Saturday that killed two other members of the Zarb family. 162. Leila Hassan al-Awdat, 41, was killed in an attack on Meghazi that wounded four others. 163. Hussam Ibrahim al-Najjar, 14, was killed in a bombing in north Gaza. His remains were taken to Beit Hanoun Hospital. 164. Rawidah Abu Harb al-Zwaida, 31, was killed. 165. Samer Tallal Hamdan was killed in a bombing in Beit Hanoun. 166. Hussein Abd al-Qadir Muheisen, 19, succumbed to wounds sustained in Gaza City. 167. Maher Thabit Abu Mar, 24, was killed in a bombing in Rafah. 168. Mohammed Salim Abu Bureis, 65, was killed in a bombing in Deir al-Balah. 169. Saddam Moussa Moamar, 23, was killed in Khan Younis. 170. Mousa Shehade Moamar, 60, was killed in Khan Younis. 171. Hanadi Hamadi Moamar, 27, was killed in Khan Younis. 172. Adham Mohammed Abed al-Fatah Abed al-Al was killed in Gaza. 173. Qassem Tallal Hamdan, 23, was killed in Beit Hanoun. 174. Hamid Suleiman Abu al-Araj Deir al-Balah, 60. 175. Abdullah Mahmoud Barakah, 24, was killed in Khan Younis. 176. Tamer Salem Kodeih, 37, was killed in Khan Younis. 177. Ziad Maher al-Najjar, 17, was killed in Khan Younis. 178. Ziad Salem al-Shawi, 25, was killed in Rafah. 179. Mohammed Yasser Hamdan, 24, was killed in Gaza. 180. Mohammed Shakib al-Agha, 22, was killed in Khan Younis. 181. Mohammed Younis Abu Youssif, 25, was killed in Khan Younis. 182. Sara Omar Sheikh al-Eid, 4, was killed in Rafah. 183. Omar Ahmad Sheikh al-Eid, 24, was killed in Rafah. 184. Jihad Ahmad Sheikh al-Eid, 48, was killed in Rafah. 185. Kamal Ated Youssif Abu Taha, 16, was killed in Khan Younis. 186. Ismail Nabil Ahmad Abu Hatab, 21, was killed in Khan Younis. 187. Ahmad Younis Abu Youssif, 28, was killed in Khan Younis. 188. Bushra Khalil Zoarob, 53, was killed in Rafah. 189. Atwa Amira al-Maamour, 63, was killed in Khan Younis. 190. Ismail Salim al-Najjar, 46, was killed in Khan Younis. 191. Mohammed Ahmad Ibrahim al-Najjar, 49, was killed in Khan Younis. 192. Suleiman Abu Louli, 33, was killed in Khan Younis. 193. Sobhi Abdel Hamid Moussa, 77, was killed in Khan Younis. 194. Ismail Ftouh, 24, was killed in Gaza. 195. Saleh Said Dahliz Rafah, 20, was killed in Rafah. 196. Yasser Abdel Mahmoun, 18, was killed in Rafah. 197. Ibrahim Khalil al-Asaafi, 66, was killed in Jiher el-Deek. 198. Mohammed Abdullah al-Zahouk, 23, was killed in Rafah. 199. Mohammed Ismail Abu Awda, 27, was killed in Rafah. 200. Mohammed Sabri al-Dibari, 20, was killed in Rafah. 201. Abdullah Mohammed Abdullah al-Irjani, 19, was killed in Khan Younis. 202. Ahmad Adel Ahmad al-Niwajha, 23, was killed in Rafah. 203. Mohammed Tayseer Sharab, 23, was killed in Khan Younis. 204. Farid Mohammed Abu Daqa, 33, was killed in Khan Younis. 205. Ashraf Khalil Abu Shanab, 33, was killed in Rafah. 206. Khadra al-Abd Salama Abu Daqa, 65, was killed in an attack on Khan Younis. 207. Omar Ramadan Hassan Abu Daqa, 24, was killed in the same attack. 208. Ibrahim Ramadan Hassan Abu Daqa, 10, was killed in the same attack. 209. Abdel Rahman Ibrahim Khalil al-Sarkhi, 37, was killed in an attack on Gaza City. 210. Ahed Atef Bakr, 10, was killed on a beach in Gaza. 211. Zakaria Ahed Bakr, 10, was killed on a beach in Gaza. 212. Mohammed Ramez Bakr, 11, was killed on a beach in Gaza. 213. Ismail Mohammed Bakr, 9, was killed on a beach in Gaza. 214. Hamza Ra’ed Thari, 6, succumbed to wounds sustained “a few days ago” and passed away. 215. Mohammed Akram Abu Amer, 34, was killed in an attack on Khan Younis. 216. Kamal Mohammed Abu Amer, 38, Mohammed’s brother, was reported seriously injured and then dead in the same attack. 217. Raqia al-Astal, 70, was killed in the bombing of a mosque in Khan Younis which killed at least three others and critically wounded several children. 218. Yasmin al-Astal, 4, was killed in the same attack. 219. Hussein Abdel Nasser al-Astal, 23, was killed in the same attack. 220. Usama Mahmoud al-Astal, 6, was critically wounded in the same attack and succumbed to his wounds shortly afterwards. 221. Hossam Shamlakh, 23, succumbed to wounds sustained in an attack on Sheikh Ajlin. 222. Mohammed Kamal Abdel Rahman, 30, was killed in an attack on Sheikh Ajlin. 223. Mohammed Mahmoud al-Qadim, 22, succumbed to wounds sustained in Deir al-Balah. 224. Zeinab Mohammed Saeed al-Abadleh, 70, died of her wounds in the Gaza European hospital. 225. Mohammed Abdel Rahman Hassouneh, 67, was killed in an attack on Rafah. 226. Mohammed Ahmad al-Hout, 41, was killed in the same attack while on his way to morning prayers. 227. Ahmad Rihan, 23, was killed in an attack on North Gaza. 228. Salam Salah Fayyad, 25, succumbed to his wounds in a hospital in Gaza’s central province. 229. Abdallah al-Akhras, 27, was killed in an attack on Rafah. 230. Bashir Abd al-A’el, 20, was killed in the same attack. 231. Mohammed Ziyad Ghanem, 25, was killed in the same attack. 232. Fulla Tarek Shaheber, 8, was killed along with two child relatives in an airstrike on their home in Gaza City. 233. Jihad Issam Shaheber, 10, was killed in the same strike. 234. Wassim Issam Shaheber, 9, was killed in the same strike. 235. Yassin al-Humaideh, 4, died of wounds suffered in an earlier attack on Gaza City. 236. Rahaf Khalil al-Jabbour, 4, was killed in an attack in Khan Younis. 237. Hamza Houssam al-Abadaleh, 29, was killed in an attack on Khan Younis. 238. Abed Ali Natiz, 26, was killed in Gaza. 239. Mohammed Salem Natiz, 4, was killed in Gaza City. 240. 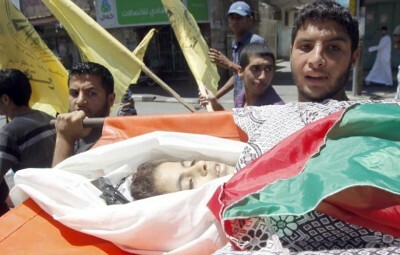 Mohammed Shadi Natiz, 15, was killed in Gaza City. 241. Salah Salah al-Shafiai was killed in Khan Younis. 242. Majdi Suleiman Salamah Jabarah, 22, was killed in Rafah. 243. Fares Jomaa al-Mahmoum, 5 months old, was killed in Rafah. 244. Nassim Mahmoud Nassir was killed in an attack on Beit Hanoun. 245. Karam Mahmoud Nassir was killed in the same attack. 246. Omar Ayyad al-Mahmoum, 18, from Rafah, was killed in an attack on al-Shawka. 247. Salmiah Suleiman Ghayyad, 70, was killed in an attack east of Rafah. 248. Rami Saqqer Abu Tawila was killed in an attack east of al-Shujayeh that wounded 7 of his family members. 249. Hamad Abu Lahyia, 23, was killed in an attack east of Qarara that critically wounded several others. 250. Bassem Mohammed Mahmoud Madi, 22, was killed in an attack east of Rafah that wounded 11 others. 251. Mohammed Abdel Fattah Rashad Fayyad, 26, was killed in Khan Younis. 252. Mahmoud Mohammed Fayyad, 25, was killed in Khan Younis. 253. Bilal Mahmoud Radwan, 23, was killed in an attack in Khan Younis. 254. Mundhir Radwan, 22, was killed in the same attack. 255. Ahmad Fawzia Radwan, 23, was killed in the same attack. 256. Mahmoud Fawzia Radwan, 24, was killed in the same attack. 257. Ismail Youssef Taha Qassim, 59, was killed in an attack in Beit Hanoun that wounded 25 others. 258. Amal Khadir Ibrahim Badour, 40, was killed in the same attack. 259. Hani As’ad Abd al-Karim al-Shami, 35, was killed in an attack in Khan Younis that killed his nephew and wounded 4 others. 260. Mohammed Hamdan Abd al-Karim al-Shami, 35, was killed in the same attack. 261. Hussam Muslim Abu Eissa, 26, was killed in Jahr al-Dik. 262. Walaa Abu Ismail Muslim,12, was killed in Abraj al-Nada. 263. Mohammed Abu Muslim, 13, was killed in Abraj al-Nada. 264. Ahmad Abu Muslim, 14, was killed in Abraj al-Nada. 265. Ahmed Abdullah al-Bahnasawi, 25, was killed in the village of Om al-Nasr in Gaza. 266. Saleh Zaghidi, 20, was killed in Rafah. 267. Alaa Abu Shbat, 23, was killed in Rafah. 268. Ahmed Hasan Saleh al-Ghalban, 23, was killed in al-Fakhari. 269. Hamada Abdallah al-Bashiti, 21, was killed in al-Fakhari. 270. Abdullah Jamal al-Samiri, 17, was killed in Khan Younis. 271. Mahmoud Ali Darwish, 40, was killed in Nusseirat. 272. Wila al-Qara, 20, was killed in Khan Younis. 273. Raafat Mohammed al-Bahloul, 35, was killed in Khan Younis. 274. Mohammed Awad Matar, 37, was killed in Beit Lahia. 275. Hamza Mohammed Abu al-Hussein, 27, was killed in Rafah. 276. Imad Hamed Alouwein, 7, was killed in a strike in Gaza City. 277. Qassem Hamed Alouwein, 4, was killed in the same strike. 278. Sara Mohammed Boustan, 13, was killed in a strike in Gaza City. 279. Rizk Ahmed al-Hayek, 2, was killed in Gaza City. 280. Mohammed Saad Mahmoud Abu Saade, 26, was killed in Khan Younis. 281. Naim Moussa Abu Jarad, 24, was killed in tank shelling on his home in Beit Hanoun along with seven members of his family. 282. Abed Moussa Abu Jarad, 30, was killed in the same attack. 283. Siham Moussa Abu Jarad, 15, was killed in the same attack. 284. Rijaa Alyan Abu Jarad, 31, was killed in the same attack. 285. Ahlam Naim Abu Jarad, 13, was killed in the same attack. 286. Hania Abdel Rahman Abu Jarad, 3, was killed in the same attack. 287. Samih Naim Abu Jarad, 1, was killed in the same attack. 288. Moussa Abdel Rahman Abu Jarad, 6, was killed in the same attack. 289. Moustafa Faysal Abu Sanina, 18, was killed in an air strike on Rafah along with two relatives. 290. Imad Faysal Abu Sanina, 18, was killed in the same attack. 291. Nizar Fayez Abu Sanina, 38, was killed in the same attack. 292. Ghassan Salem Moussa, 28, was killed in Khan Younis. 293. Mohammed Salem Shaat, 20, was killed in Khan Younis. 294. Ahmed Salem Shaat, 22, was killed in the same attack. 295. Amjad Salem Shaat, 15, was killed in the same attack. 296. Mohamed Talal al-Sanaa, 20, was killed in Rafah. 297. Ayad Ismail al-Rakib, 26, was killed in an attack on Khan Younis. 298. Yehya Bassam al-Sirri, 20, was killed in Khan Younis. 299. Mohammed Bassam al-Sirri, 17, was killed in the same attack. 300. Mahmoud Redda Salhia, 56, was killed in Khan Younis. 301. Moustafa Redda Salhia, 21, was killed in the same attack. 302. Mohammed Moustafa Salhia, 22, was killed in the same attack. 303. Wissam Redda Salhia, 15, was killed in the same attack. 304. Ibrahim Jamal Kamal Nasser, 13, was killed in Khan Younis. 305. Ahmed Mahmoud Hassan Aziz, 34, Khan Younis. 306. Said Ola Issa, 30, was killed in the central disrict. 307. Mohammed Awad Fares Nassar, 25, was killed in Khan Younis. 308. Mohammed Jihad al-Kara, 29, was killed in Khan Younis. 309. Rashdi Khaled Nassar, 24, was killed in the same Khan Younis. 310. Raed Walid Likan, 27, was killed in Khan Younis. 311. Raafat Ali Bahloul, 36, was killed in Khan Younis. 312. Bilal Ismail Abu Daqqah, 33, was killed in Khan Younis. 313. Mohammed Ismail Samour, 21, was killed in Khan Younis. 314. Ismail Ramadan al-Lawalhi, 21, was killed in Khan Younis. 315. Mohammed Ziad al-Rahhel, 6, was killed in Beit Lahia. 316. Mohammed Ahmed Abu Zaanounah, 36, was killed in Gaza. 317. Mohammed Rafic al-Rahhel, 22, was killed in Beit Lahia. 318. Fadel Mohammed al-Banna, 29. was killed in Jbalia. 319. Mohammed Atallah Awdeh Saadat, 25, was killed in Beit Hanoun. 320. Mohammed Abedel Rahman Abu Hamad, 25, was killed in Beit Lahia. 321. Maali Abedel Rahman Suleiman Abu Zayed, 24, al-Wista. 322. Mahmoud Abdel Hamid al-Zuweidi, 23, was killed in Beit Lahia. 323. Dalia Abdel Hamid al-Zuweidi, 37, was killed in Beit Lahia. 324. Ruaia Mahmoud al-Zuweidi, 6, was killed in Beit Lahia. 325. Nagham Mahmoud al-Zuweidi, 2, was killed in Beit Lahia. 326. Amer Hamoudah, 7, was killed in Beit Lahia. 327. Mahmoud Rizk Mohammed Hamoudah, 18, was killed in Beit Lahia. 328. Mohammed Khaled Jamil al-Zuweidi, 20, was killed in Beit Lahia. 329. Mohammed Ahmad al-Saidi, 18, was killed in Khan Younis. 330. Abdel Rahman Mohammed Awdah Barak, 23, al-Wista. 331. Tarek Samir Khalil al-Hitto, 26, was killed in al-Wista. 332. Mahmoud al-Sharif, 24, was killed in al-Wista. 333. Mohammed Fathi al-Ghalban, 23, was killed in Khan Younis. 334. Mahmoud Anwar Abu Shabab, 16, was killed in Rafah. 335. Mo’men Taysir al-Abed Abu Dan, 24, was killed in al-Wista. 336. Abdel Aziz Samir Abu Zeiter, 31, was killed in al-Wista. 337. Mohammed Ziad Zaabout, 24, was killed in Gaza. 338. Hatem Ziadah Zaabout, 22, was killed in Gaza. 339. Ahmad Maher Mohammed Abu Thuria, 25, was killed in al-Wista. 340. Abdullah Ghazi Abdullah al-Masri, 30, was killed in al-Wista. 341. Ayman Hisham al-Naaouq, 25, was killed in al-Wista. 342. Akram Mahmoud al-Matwouk, 37, was killed in Jabalia. 343. Salem Ali Abu Saadah was killed in Khan Younis. 344. Hosni Mahmoud al-Absi, 56, was killed in Rafah. 346. Hamza Mahmoud Moamar, 21, was killed in Rafah. 347. Anas Mahmoud Moamar, 17, was killed in rafah. 348. Mohammed Ali Jundieh, 38, was killed in Gaza. 353. Fahmi Abdel Aziz Abu Said, 29, was killed in al-Wista. 354. Ahmad Tawfiq Zannoun, 26, was killed in Rafah. 355. Sohaib Ali Jomaa Abu Qoura, 21, was killed in Rafah. 356. Homeid Sobh Mohammed Abu Foujo, 22, was killed in Rafah. 357. Toufic Marshoud, 52, was killed in Gaza. 358. Ibrahim Khalil Abd Ammar, 13, was killed in al-Shujayeh. 359. Ibrahim Salim Joumea al-Sahbani, 20, was killed in al-Shujayeh. 360. Ibrahim Arrif Ibrahim al-Ghalayini, 26, was killed in al-Shujayeh. 361. Osama Khalil Ismail al-Hayya, 30, was killed in al-Shujayeh. 362. Osama Roubhi Shahta Ayyad, 31, was killed in al-Shujayeh. 363. Isra Yassir Atieh Hamidieh, 28, was killed in al-Shujayeh. 364. Akram Mohammed Ali al-Skafi, 63, was killed in al-Shujayeh. 365. Iman Khalil Abed Ammar, 9, was killed in al-Shujayeh. 366. Iman Mohammed Ibrahim Hamadeh, 40, was killed in al-Shujayeh. 367. Ahmad Ishaq Youssef al-Ramlawi, 33, was killed in al-Shujayeh. 368. Ahmad Sammi Diab Ayyad, 27, was killed in al-Shujayeh. 369. Ahmad Mohammed Ahmad Abu Zanouna, 28, was killed in al-Shujayeh. 370. Imama Isama Khalil al-Hayya, 9, was killed in al-Shujayeh. 371. Talla Akram Ahmad al-Atwi, 7, was killed in al-Shujayeh. 372. Tawfiq Ibrawi Salem Marshoud, 52, was killed in al-Shujayeh. 373. Hatim Ziad Ali al-Zabout, 24, was killed in al-Shujayeh. 374. Khalid Riyad Mohammed Hamad, 25, was killed in al-Shujayeh. 375. Khadija Ali Moussa Shahadi, 62, was killed in al-Shujayeh. 376. Khalil Osama Khalil al-Hayya, 7, was killed in al-Shujayeh. 377. Khalil Salim Ibrahim Mousbah, 53, was killed in al-Shujayeh. 378. Dima Adil Abdullah Aslim, 2, was killed in al-Shujayeh. 379. Dina Rushdi Omar Hamadi, 15, was killed in al-Shujayeh. 380. Rahaf Akram Ismail Abu Joumea, 4, was killed in al-Shujayeh. 381. Saji Hassan Akram al-Hallaq, 4, was killed in al-Shujayeh. 382. Samia Hamid Mohammed al-Shaykh Khalil, 3, was killed in al-Shujayeh. 383. Soad Mohammed Abdel Razik al-Hallaq, 62, was killed in al-Shujayeh. 384. Samar Osama Khalil al-Hallaq, 29, was killed in al-Shujayeh. 385. Shadi Ziad Hassan Aslim, 15, was killed in al-Shujayeh. 386. Shireen Fathi Othman Ayyad, 18, was killed in al-Shujayeh. 387. Adil Abdullah Salim Aslim, 39, was killed in al-Shujayeh. 388. Assem Khalil Abed Ammar, 4, was killed in al-Shujayeh. 389. Ahed Saed Moussa al-Sirsik, 30, was killed in al-Shujayeh. 390. Ayisha Ali Mahmoud Zayid, 54, was killed in al-Shujayeh. 391. Abdel Rahman Akram Mohammed al-Skafi, 22, was killed in al-Shujayeh. 392. Abdel Rahman Abdel Razak Abdel Rahman al-Shaykh Khalil, 24, was killed in al-Shujayeh. 393. Abdullah Mansour Radwan Ammara, 23, was killed in al-Shujayeh. 394. Abed Rabboh Ahmad Mohammed Zayid, 58, was killed in al-Shujayeh. 395. Isam Atieh Said al-Skafi, 26, was killed in al-Shujayeh. 396. Ola Ziad Hassan Aslim, 11, was killed in al-Shujayeh. 397. Alaa Jamal al-Din Mohammed Bourda, 35, was killed in al-Shujayeh. 398. Ali Mohammed Hassan al-Skafi, 27, was killed in al-Shujayeh. 399. Omar Jamil Soubhi Hammouda, 10, was killed in al-Shujayeh. 400. Ghada Soubhi Sa’adi Ayyad, 9, was killed in al-Shujayeh. 401. Ghada Ibrahim Suleiman Udwan, 39, was killed in al-Shujayeh. 402. Fadi Ziad Hassan Aslim, 10, was killed in al-Shujayeh. 403. Fatima Abdel Rahim Abdel Qadir Abu Ammouna, 55, was killed in al-Shujayeh. 404. Fida’a Rafiq Diab Ayyad, 24, was killed in al-Shujayeh. 405. Fahmi Abdel Aziz Sa’ed Abu Said, 29, was killed in al-Shujayeh. 406. Qinan Hassan Akram al-Hallaq, 6, was killed in al-Shujayeh. 407. Maysa Abdel Rahman Said al-Sirsawi, 37, was killed in al-Shujayeh. 408. Mohammed Ashraf Rafiq Ayyad, 6, was killed in al-Shujayeh. 409. Mohammed Hassan Mohammad al-Skafi, 53, was killed in al-Shujayeh. 410. Mohammed Rami Fathi Ayyad, 2, was killed in al-Shujayeh. 411. Mohammed Ra’ed Ihsan Aqqila, 19, was killed in al-Shujayeh. 412. Mohammed Ziad Ali al-Zabbout, 23, was killed in al-Shujayeh. 413. Mohammed Mohammed Ali Muharrib Jundiyah, 38, was killed in al-Shujayeh. 414. Mohammed Hani Mohammad al-Halaq, 2, was killed in al-Shujayeh. 415. Marrah Shakil Ahmad al-Jammal, 11, was killed in al-Shujayeh. 416. Marwan Mounir Saleh Qunfud, 23, was killed in al-Shujayeh. 417. Marwa Salman Ahmad al-Sirsawi, 13, was killed in al-Shujayeh. 418. Moussaeb al-Khayr Salah al-Din Said al-Skafi, 27, was killed in al-Shujayeh. 419. Mona Suleiman Ahmad al-Sheikh Khalil, 49, was killed in al-Shujayeh. 420. Mona Abdel Rahman Mahmoud Ayyad, 42, was killed in al-Shujayeh. 421. Nirmin Rafiq Diab Ayyad, 20, was killed in al-Shujayeh. 422. Hala Akram Hassan al-Hallaq, 27, was killed in al-Shujayeh. 423. Hala Soubhi Saidi Ayyad, 25, was killed in al-Shujayeh. 424. Hala Saqr Hassan al-Hayya, 29, was killed in al-Shujayeh. 425. Hani Mohammed Ahmad al-Hallaq, 29, was killed in al-Shujayeh. 426. Hiba Hamid Mohammed al-Shaykh Khalil, 13, was killed in al-Shujayeh. 427. Youssef Ahmad Younis Mustafa, 62, was killed in al-Shujayeh. 428. Youssef Salim Hamto Habib, 62, was killed in al-Shujayeh. 430. Mohammed Ayman al-Shaer, 5, was killed in Khan Younis. 431. Leila Hasan al-Shaer, 33, was killed in Khan Younis. 432. Salah Saleh al-Shaer, in his forties, was killed in Khan Younis. 433. Hibatullah Akram al-Shaer, 7, was killed in Khan Younis. 434. Youssef Sha’aban Ziyadeh, 44, was killed in al-Barij. 435. Jamil Sha’aban Ziyadeh, 53, was killed in the same attack. 436. Sha’aban Jamil Ziyadeh, 12, was killed in the same attack. 437. Omar Sha’aban Ziyadeh was killed in the same attack. 438. Muftiya Mohammed Ziyadeh was killed in the same attack. 439. Bayyan Abdel Latif Ziyadeh was killed in the same attack. 441. Mohammed Mahmoud al-Muqadama, 30, was killed in the same attack. 442. Najah Sa’ad al-Din Daraji, 65, was killed in Rafah. 443. Abdullah Youssef Daraji, 3, was killed in the same attack. 444. Mohammed Baghdar al-Dughma, 20, was killed in Beni Soheileh. 445. Mohammed Raja’ Mohammed Handam, 15, was killed in Rafah. 446. Aya Bahjat Abu Sultan, 15, was killed in Beit Lahya. 447. Hani Mohammed al-Halaq, 29, was killed in al-Ramal. 448. Suad Mohammed al-Halaq, 62, was killed in the same attack. 449. Qinan Akram al-Halaq, 5, was killed in the same attack. 450. Samar Osama al-Halaq, 29, was killed in the same attack. 451. Saji al-Halaq was killed in the same attack. 452. Ibrahim Khalil Ammar was killed in the same attack. 453. Ahmad Yassin was killed in the same attack. 454. Rayan Taysir Abu Jamea, 8, was killed in Khan Younis. 455. Fatima Mahmoud Abu Jamea was killed in the same attack. 456. Sabah Tawfiq Mahmoud Abu Jamea, 38, was killed in the same attack. 457. Rozan Tawfiq Ahmad Abu Jamea, 14, was killed in the same attack. Her body was recovered from the rubble on Monday. 458. Jawdat al-Tawfiq Ahmad Abu Jamea, 24, was killed in Khan Younis. 459. Tawfiq Ahmad Abu Jamea, 5, was killed in the same attack. 460. Haifa Tawfiq Ahmad Abu Jamea, 9, was killed in the same attack. 461. Yasmin Ahmad Salama Abu Jamea, 25, was killed in the same attack. 462. Suheila Bassam Ahmad Abu Jamea was killed in the same attack. 463. Shahinaz Walid Ahmad Abu Jamea, 1, was killed in the same attack. 464. Hossam Hossam Abu Qaynas, 5, was killed in the same attack. 465. An unidentified woman was killed in the same attack. 466. An unidentified woman in her 30s was killed in the same attack. 467. An unidentified child was killed in the same attack. 468. Ahmad Suleiman Mahmoud Sahmoud, 34, was killed in the same attack. 469. Minwa Abdel Bassit Ahmad al-Sabea, 37, was killed in Beit Hanoun. 470. Mahmoud Moussa Abu Anzar, 25, was killed in Khan Younis. 472. Unidentified body in Kamal Adwan Hospital. 473. Unidentified body in Kamal Adwan Hospital. 474. Abdullah Omar al-Maghribi was killed in Rafah. 475. Najah al-Maghribi was killed in the same attack. 476. Bassem al-Brayim was killed in Khan Younis. 477. Ra’ed Mansour Nayfeh was killed in Gaza City. 478. Fuad Jaber was killed in Gaza City. 479. Mohammed Mahmoud Hussein Moammar was killed in Rafah. 480. Hamza Mahmoud Hussein Moammer was killed in the same attack. 481. Anas Mahmoud Hussein Moammer was killed in the same attack. 482. Bilal Jaber Mohammed al-Ashhab, 22, was killed in al-Mughraqa. 483. An unidentified body was recovered along with Bilal. 484. Ra’ed Ismail al-Bardawil, 26, was killed in Rafah. 493. Sumoud Nasr Siyam, 26, was killed in Rafah. 494. Mohammed Mahrous Salam Siyam, 25, was killed in the same attack. 495. Badr Nabil Mahrous Siyam, 25, was killed in the same attack. 496. Ahmad Ayman Mahrous Siyam, 17, was killed in the same attack. 497. Mustafa Nabil Mahrous Siyam, 12, was killed in the same attack. 498. Ghaydaa Nabil Mahrous Siyam, 8, was killed in the same attack. 499. Shireen Mohammed Salam Siyam, 32, was killed in the same attack. 500. Dalal Nabil Mahrous Siyam, 8, was killed in the same attack. 501. Kamal Mahrous Salama Siyam, 27, was killed in the same attack. 502. Abdullah Trad Abu Hjeir, 16, was killed in Nusseirat. 503. Ahmad Moussa Shaykh al-Eid, 23, was killed in Rafah. 504. Zakariah Massoud al-Ashqar, 24, was killed in Gaza City. 505. Kamal Talal Hassan al-Masri, 22, was killed in Beit Hanoun. 506. Ra’ed Isam Daoud, 30, was killed in al-Zeitoun. 507. Fatima Abu Ammouna, 55, was killed in al-Shujayeh. 508. Ahmad Mohammed Azzam, 19, was killed in al-Shujayeh. 509. Mahmoud Hassan al-Nakhala was killed in Gaza. 510. Kamal Massoud, 21, was killed in al-Zeitoun. 511. Saleh Badawi, 31, was killed in al-Zeitoun. 512. Unidentified body in the Gaza European hospital. 513. Majdi Mahmoud al-Yazaji, 56, was killed in Gaza City. 514. Mohammed Samih al-Ghalban was killed in Gaza City. 515. Karam Ibrahim Atieh Barham, 25, was killed in Khan Younis. 516. Nidal Ali Abu Daqqa, 26, was killed in Khan Younis. 517. Nidal Joumea Abu Assi, 43, was killed in Khan Younis. 518. Mohammed Mahmoud al-Maghribi, 24, was killed in Khan Younis. 519. Mayar al-Yazaji, 2, was killed in al-Karama. 520. Yasmin al-Yazaji was killed in the same attack. 521. Wajdi al-Yazaji was killed in the same attack. 522. Safinaz al-Yazaji was killed in the same attack. 523. Unidentified child, 5, was killed in the same attack. 524. Mahran Kamel Jondeyah, 32, was killed in al-Shujayeh. 525. Tamer Nayef Jondeyah, 30, was killed in al-Shujayeh. 526. Rahma Ahmad Jondeyah, 50, was killed in al-Shujayeh. 528. An unidentified person was killed in the Israeli shelling of Al Aqsa Martyrs Hospital. The attack killed three others and wounded 50. 529. An unidentified person was killed in the same attack. 530. An unidentified person was killed in the same attack. 531. An unidentified person was killed in the same attack. 532. Youssef Ghazi Hamidieh, 25, was killed in al-Shujayeh. 533. Moataz Jamal Hamidieh, 18, was killed in the same attack. 534. Aed Jamal Hamidieh, 21, was killed in the same attack. 535. Aya Yasser al-Qassas was killed in Gaza City. 536. Aesha Yasser al-Qassas was killed in the same attack. 537. Nasma Iyad al-Qassas was killed in the same attack. 538. Lamyaa Iyad al-Qassas was killed in the same attack. 539. Israa al-Qassas was killed in the same attack. 540. Yasmin al-Qassas was killed in the same attack. 541. Arwa al-Qassas was killed in the same attack. 542. Aliaa al-Syam was killed in Gaza City. 543. Fayza al-Syam was killed in Gaza City. 544. Soumaya al-Syam was killed in Gaza City. 545. Fatima Ahmad al-Arja was killed in Rafah. 546. Atieh Youssef Dardouna, 26, was killed in Jabalia. 547. Unidentified was killed in Rafah. 548. Unidentified was killed in Rafah. 549. Unidentified was killed in Rafah. 550. Fadi Azmi Brayaem was killed in Deir al-Balah. 551. Othman Salem Brayaem was killed in the same attack. 552. Salem Abdel Majeed Brayaem was killed in the same attack. 553. Unidentified was killed in al-Shamaa mosque in Gaza City. 554. Unidentified was killed in al-Shamaa mosque in Gaza City. 555. Ibrahim Dib Ahmad al-Kilani, 53, was killed in a strike on Israa tower in Gaza City along with his wife and their five children. Four members of his wife’s family were also killed in the attack. 556. Taghrid Shaaban Mohammed al-Kilani, 45, was killed in the same attack. 557. Yaser Ibrahim Dib al-Kilani, 8, was killed in the same attack. 558. Elias Ibrahim Dib al-Kilani, 4, was killed in the same attack. 559. Sawsan Ibrahim Dib al-Kilani, 11, was killed in the same attack. 560. Rim Ibrahim Dib al-Kilani, 12, was killed in the same attack. 561. Yaseen Ibrahim Dib al-Kilani, 9, was killed in the same attack. 562. Mahmoud Shaaban Mohammed Derbas, 37, was killed in the same attack. 563. Aida Shaaban Mohammed Derbas, 47, was killed in the same attack. 564. Soura Shaaban mohammed Derbas, 41, was killed in the same attack. 565. Inas Shaaban Mohammed Derbas, 30, was killed in the same attack. 566. Jihad Mahmoud al-Maghribi, 22, was killed in Khan Younis. 567. Fadi Bashir al-Abadleh, 22, was killed in Khan Younis. 571. Wael Jamal Harb, 32, was killed in Gaza. 572. Hasan Khodor Bakr, 60, was killed in Gaza. 573. Mahmoud Suleiman Abu Sobha, 55, was killed in Khan Younis. 574. Abdullah Ismail al-Bahisi, 27, was killed in Deir al-Balah. 575. Misaab Saleh Salameh, 19, was killed in Khan Younis. 576. Mohammed Nasr Haroun, 38, was killed in al-Nsayrat. 577. Naji Jamal al-Fajm, 26, was killed in Khan Younis. 578. Ibtihal Ibrahim al-Rimahi was killed in Deir al-Balah. 579. Youssef Ibrahim al-Rimahi was killed in Deir al-Balah. 580. Iman Ibrahim al-Rimahi was killed in Deir al-Balah. 581. Salwa Abu Monifi was killed in Deir al-Balah. 582. Samira Abu Monifi was killed in Deir al-Balah. 583. Haytham Samir al-Agha, 26, was killed in Khan Younis. 584. Walid Suleiman Abu Daher, 21, was killed in Khan Younis. 585. Yasmin Ahmad Abu Mor, 25, was killed in Rafah. 586. Sameh Zahir al-Sowafiri, 29, was killed in Rafah. 587. Mohammed Moussa Abu Fayad, 36, was killed in Rafah. 588. Fatima Hasan Azzam, 70, was killed in al-Zaytoun. 589. Maryam Hasan Azzam, 50, was killed in al-Zaytoun. 606. Soha Naim al-Kharwat, 25, was killed in north Gaza along with her daughter Mona. She was pregnant. 607. Mona Rami al-Kharwat, 4, was killed in the same attack. 608. Ahmad Salah abu Sido, 17, was killed in al-Mahatta. 609. Mahmoud Slim Mostafa Daraj, 22, was killed in Jabalia. 610. Ibrahim Sobhi al-Firi, 25, was killed in Beit Lahia. 611. Ahmad Assaad al-Boudi, 24, was killed in Beit Lahia. 612. Unknown was killed in Beit Lahia. 613. Unknown was killed in al-Braij camp. 614. Unknown was killed in al-Braij camp. 615. Unknown was killed in al-Braij camp. 616. Hasan Shaaban Khamisi, 28, was killed in al-Maghazi camp. 617. Tareq Fayeq Hajjaj, 22, was killed in Gaza. 618. Ahmad Ziad Hajjaj, 21, was killed in the same attack. 619. Mohammed Shahadeh Hajjaj, 31, was killed in the same attack. 620. Fayza Saleh Abdul Rahman Hajjaj, 66, was killed in the same attack. 621. Rawan Ziad Hajjaj, 15, was killed in the same attack. 622. Youssef Mohammed Hajjaj, 28, was killed in the same attack. 623. Hakema Nafea Abu Edwan, 75, was killed in Rafah. 624. Najah Nafea Abu Edwan, 85, was killed in the same attack. 625. Misaab Nafeth al-Ajala, 30, was killed in al-Shujayeh. 626. Khalaf Atieh Abu Sanima, 18, was killed in Rafah. 627. Khalil Atieh Abu Sanima, 20, was killed in the same attack. World burns, genocide in Gaza and Obama.... what does he do? The "only Democracy" in the Middle East? Really? "The Israeli Broadcasting Authority has banned a radio advertisement from a human rights organisation which listed the names of some of the scores of children killed in Gaza since the conflict began 17 days ago. It's about an FBI agent-turned-whistleblower and familial sexual assault deemed to be accidental.